Another Winter arrives… Elie’s right foot gets infected. While he is in the infirmary, the Russian front draws closer and the Nazis decide to evacuate the camp. 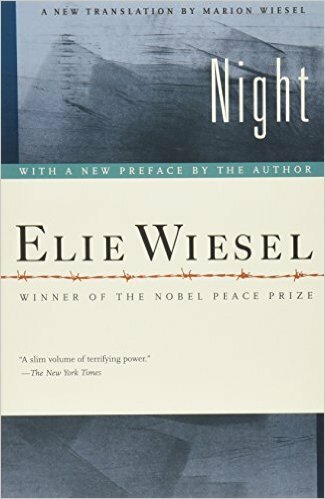 Elie and his father are among the thousands evacuated – in the form of a death march! Gruelling days of marching follow, without food or water and in constantly falling snow. They leave a trail of corpses in their wake. The survivors reach the camp of Gleiwitz. After three days, again wthout food or water, they are marched to a field to await transport deeper into Germany. A long train with open cattle cars appears. Transported in freezing snow and wind for days, when they finally arrive at Buchenwald only twelve of the hundred crammed into their cattle car have survived, including Elie and his father. Soon after, his father succumbs to the torture and is taken to the crematorium. The American army arrives to liberate the camp three months later. One day when I was able to get up, I decided to look at myself in the mirror on the opposite wall. I had not seen myself since the ghetto. a corpse was contemplating me. The look in his eyes as he gazed at me has never left me. This entry was posted in A Winter with ELIE WIESEL by Cindy Lou. Bookmark the permalink.